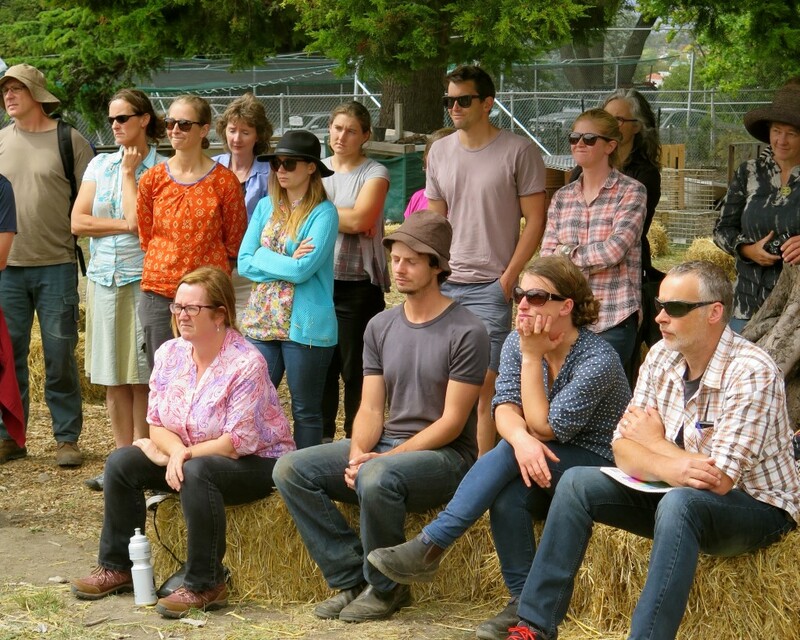 We’ve just hosted Jean-Martin Fortier for a flying visit to Hobart to teach a packed out Market Gardening Masterclass. 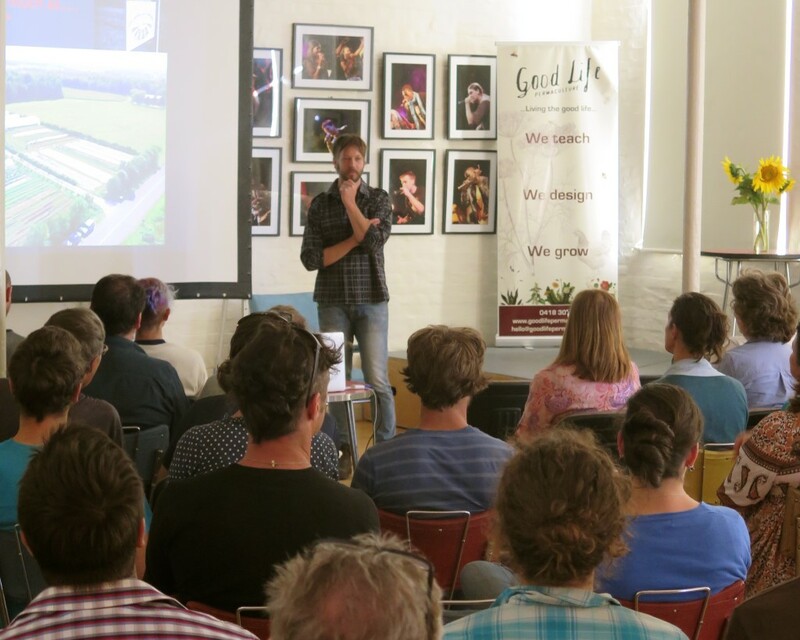 It was such a treat to have him here *and* to have a full room of some of Tasmania’s finest, most dedicated growers and wanna be growers. With his wife, Maude-Hélène Desroches, Jean-Martin runs Les Jardins de la Grelinette, an internationally recognized 10-acre micro-farm in Quebec, Canada. 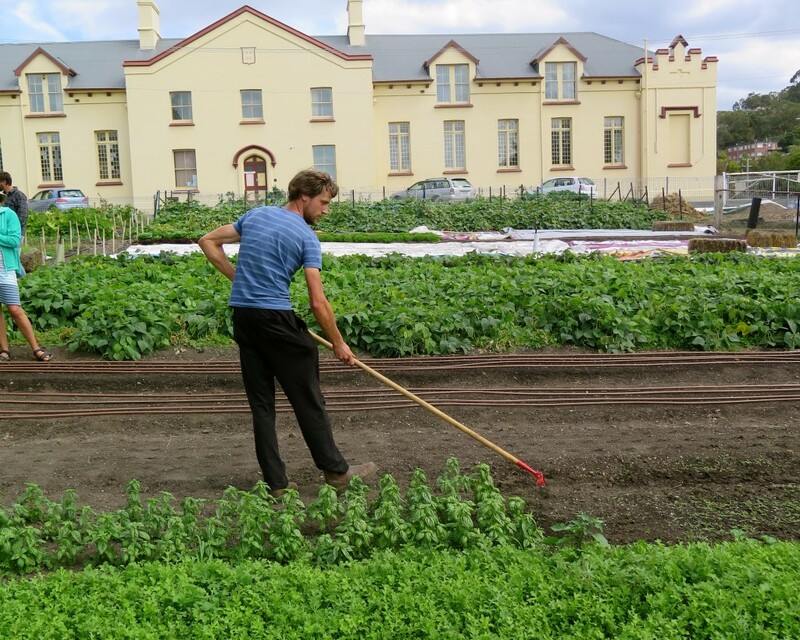 With only 1½ acres cultivated in permanent beds, the farm grosses more than $100 000 per acre with operating margins of about 60 per cent, enough to financially sustain his family. The focus at la Grelinette has been to grow better, not bigger, in order to optimize the cropping system, making it more lucrative and viable in the process. 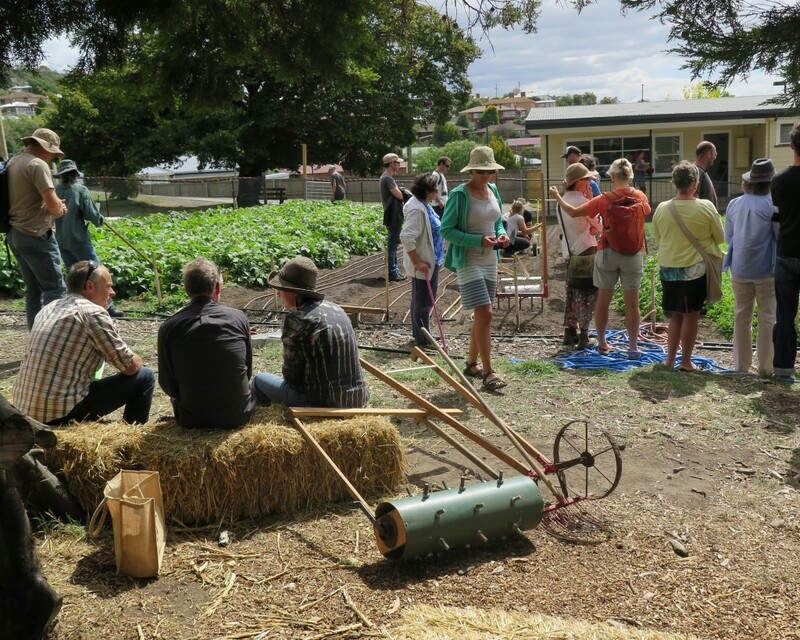 We held this workshop across the road from the Hobart City Farm, which meant we could pop over, play with their very awesome tool collection and have a sticky beak at a young, small market garden which is largely base on Jean-Martin’s book, The Market Gardener. 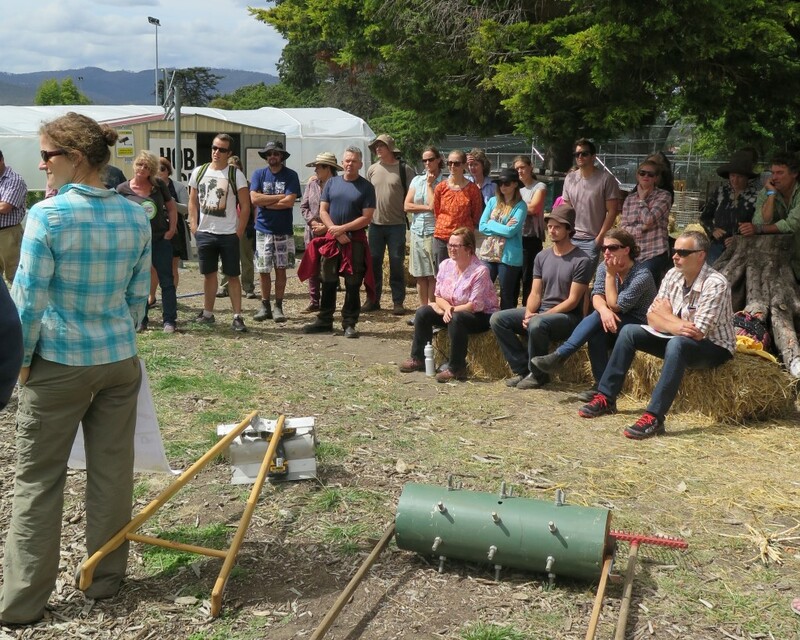 The wonderful group of people getting introduced to some of the unique tools living at the Farm. 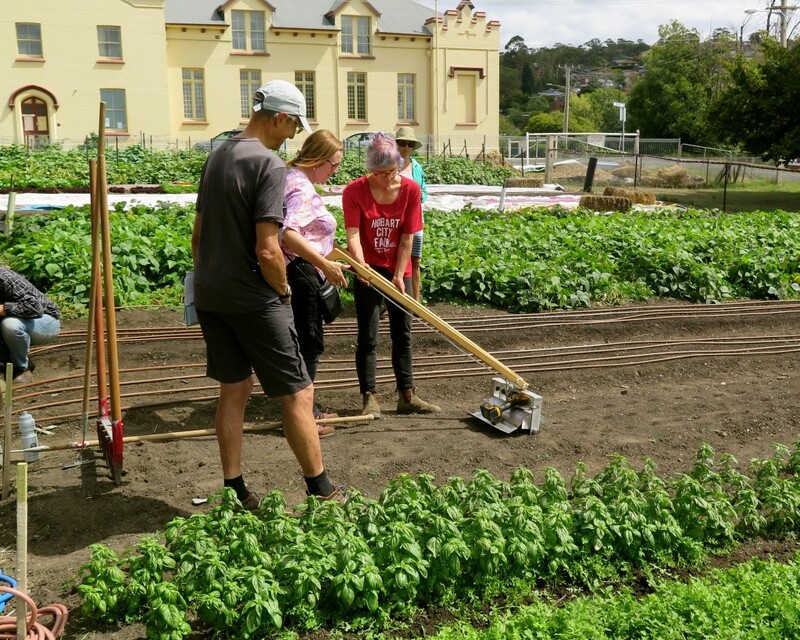 Bridget from the Hobart City Farm showing how to work the tilther – a tool that only works the top inch of the bed to prep it for the next crop. 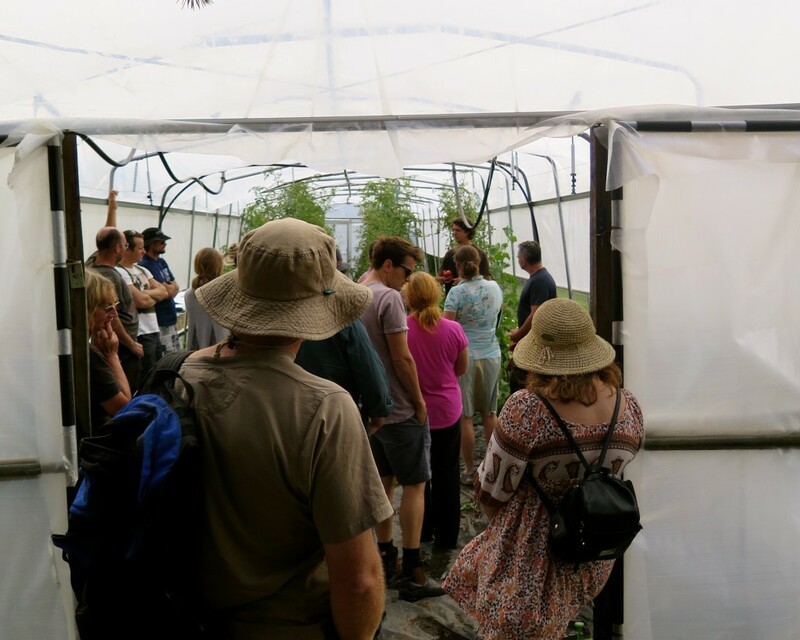 Using similar methods to Jean-Martin, the Hobart City Farm are growing 150 tomato plants in their hot house in a space which would normally grow less than half that. One of the tools on show was the quick cut greens harvester, specifically designed to harvest young greens exceptionally fast and efficiently while still maintaining quality. It’s pretty cool. It’s not often we get the opportunity to meet the people we look up, so when we do – we’re super grateful and even more so when you find out they’re as cool as you hoped they’d be. 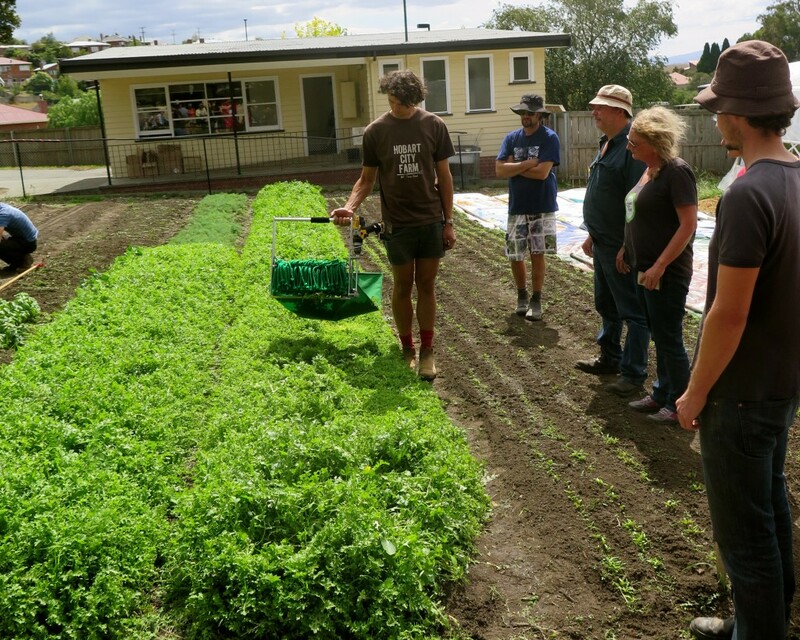 Thanks for visiting our little island Jean-Martin and for injecting some of your experience, passion and good vibes into our community of growers – the ripple affects will be long and many. 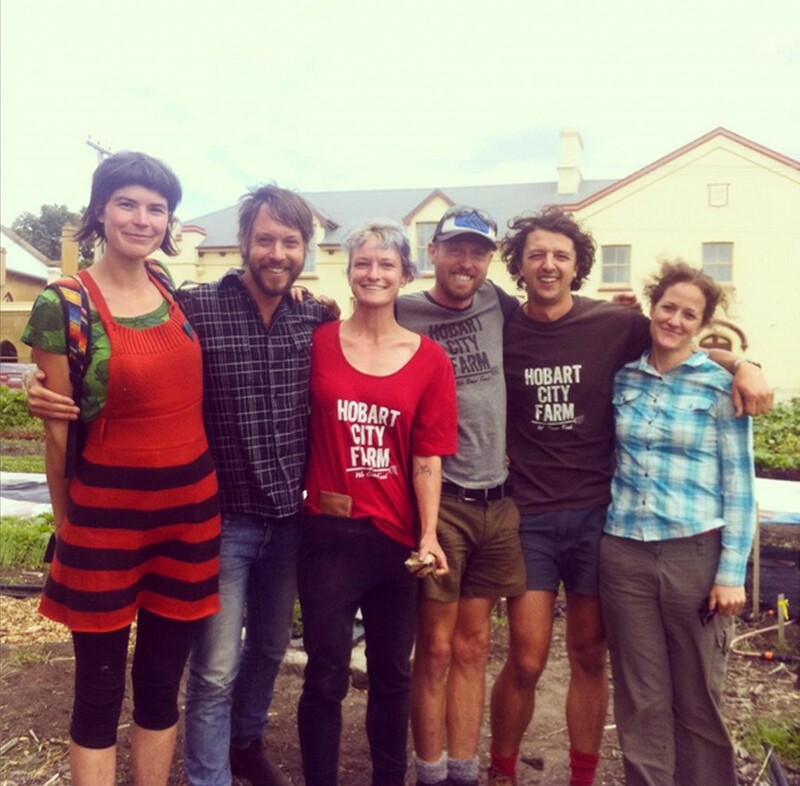 Jean-Martin, squished between the Hobart City Farm team and me (Hannah) – I’m actually involved in both the Farm and Good Life Permaculture – which is nice and confusing, but mostly just nice. 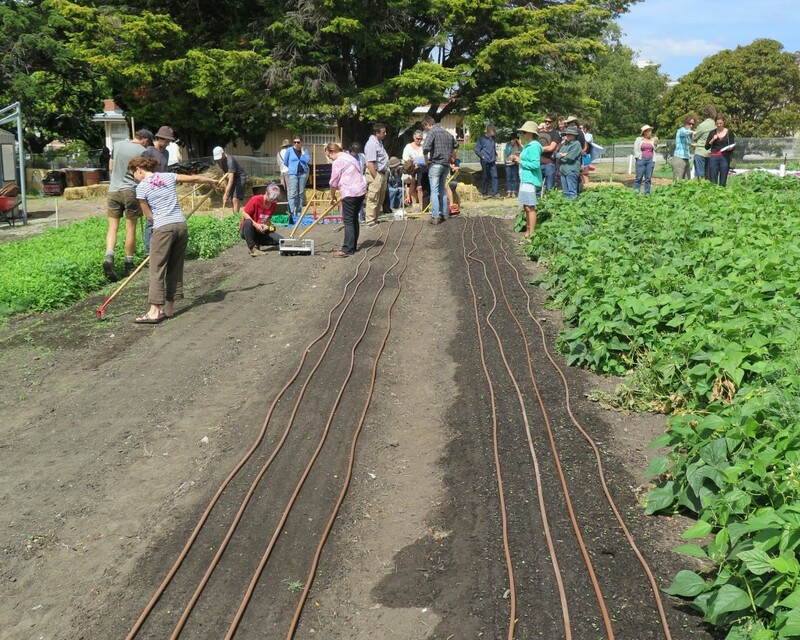 Image from Hobart City Farm. You can check out more tools for the market gardener here. You can see more of everything on The Market Gardener’s website here. Hi Nat, we got ours from the US, but the name of the business escapes my mind at the moment. I do remember we had to wait long time before it arrived. 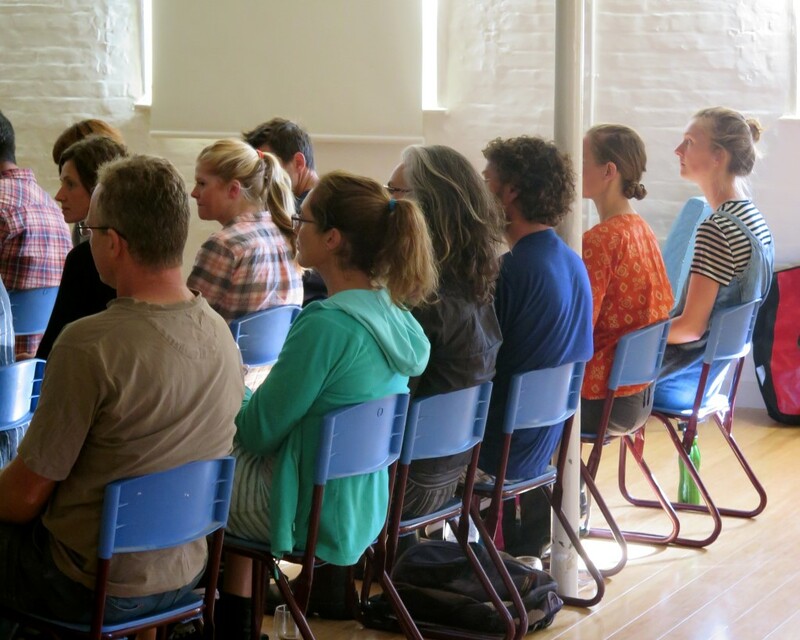 I’ll ask James (another member of the City Farm) as he ordered it and get back to you :-).